Before dawn on September 16th, 1776, the leader of the Knowlton Rangers, Lieutenant Colonel Thomas Knowlton, and from 120 to 150 men, left the front lines along the ridge above “the Heights of Harlem” to see what the British were up to and might do next. 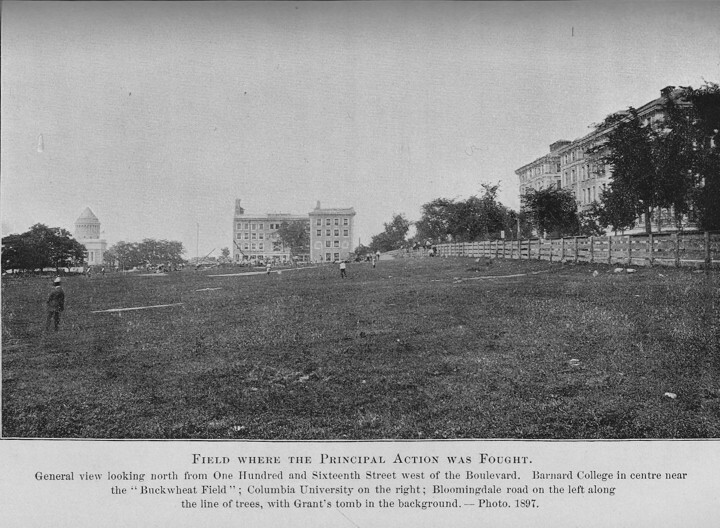 They stayed close to the Hudson (then called the North River), passed by the Hoaglandt house at the northern end of the Bloomingdale Road (today Riverside Drive and 114th St) and through the Harlem Heights (known later as Morningside Heights) as futher south to about 106th St and WEA. When the 120 to 150 Knowlton Rangers advanced south to find the British they included Thomas Knowlton’s older brother, Daniel and his 16 year-old son Frederick. At about 106th St and WEA there was a solidly built stone house of farmer Nicholas Jones. The Rangers were moving stealthily through the farm fields when they were spotted by British pickets guarding the Bloomingdale Road. The pickets fired their guns to alert the 2nd and 3rd regiments of Leslie’s light infantry that was camped near 104th St along the Bloomingdale Road. Some of the British fired from 104th St towards the Rangers, and the Rangers fired back from behind one of Jones’s stone walls. Soon, however, 400 British troops materialized and started moving in column up the Bloomingdale Road. Knowlton directed his men to hold their fire until the marching British reached 107th St. Then the Rangers stood up and fired. The British and the colonial Rangers fired back and forth for about a half an hour. The fighting stopped when the sound of bagpipes and drums of the Royal Highland Regiment of Foot, commonly known as the Black Watch, were heard in the distant east. Each side sustained about 10 casualties. The Rangers fell back, firing selectively to cover their withdrawal. The Black Watch stopped, but Leslie’s Light Infantry pursued the Rangers to the end of the Bloomingdale Road by the Hoaglandt farmhouse at 114th St and then positioned themselves on the rise known as Claremont just north of where Grant’s Tomb is today. The Rangers continued retreating into the Hollow Way valley at about 125th St and Broadway. On the Claremont rise, a British bugler, in full view of colonial General Nathanial Greene’s troops on the ridge north of the Hollow Way, raised his bugle to his lips and blew the fox-hunter’s signal for the end of the chase. This was an insult indicating that “the chase was over” and the colonials were as good as fallen. Washington’s trusted aide, Colonel Joseph Reed advocated for a response, but Washington was more calculated. He was not as strong a tactician as General Howe, but he was steady, persistent, and flexible. His decision was to try to lure Leslie’s men down from the Claremont rise, but at the same time, send forces to the east that would come up through the difficult ridge of Harlem Heights – think of the ridge in Morningside Park from 110th St to 122nd St. If successful, Leslie’s light infantry would be surprised from the rear and cut off from their other troops. Colonial General John Nixon was entrusted with fooling Leslie’s units that an attack was underway to lure them into the Hollow Way. Nixon chose Lieutenant Archibald Crary from Rhode Island to command about 150 volunteers to make as much noise as possible moving down into the Hollow Way and create the illusion that they would storm Leslie and his men on the Claremont rise (site of Grant’s Tomb). Meanwhile, Colonel Knowlton would command about 230 men, including his Rangers and three companies from Colonel George Weedon’s 3rd Virginia Regiment under Major Andrew Leitch, to surprise Leslie’s men by outflanking them from the south, by way of the difficult ridges of Morningside Park. Crary’s volunteers ran down the slopes in hopes of getting a reaction from the British. A number of Leslie’s men rushed down their slope to fire at the colonials. 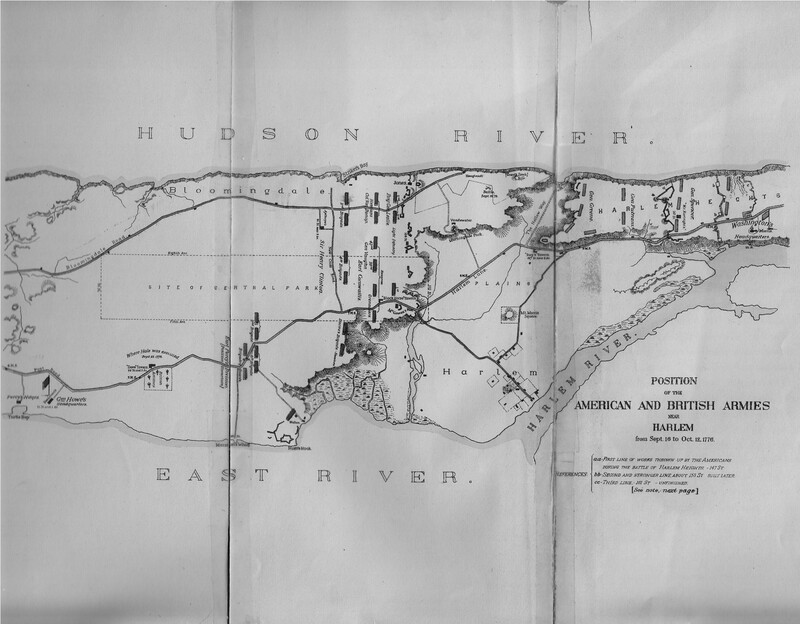 The Hollow Way, however, was largely a swamp that came in from the Hudson River to about Broadway and from 125th to 130th Sts. So all the shooting that went on, and it went on for awhile, was across the swamp. There was no close combat. But the American General Nixon decided to bolster the effort on his side with all the rest of the 800 men that he had. Meanwhile Knowlton and his 230 men came down from Point of Rocks by St Nicholas Avenue and 127th St. They found their way to an open rise where today’s General Grant Houses are located between 123rd and 124th St and between Amsterdam Avenue and Broadway. From here they hoped to get behind Leslie’s men. But, perhaps in their enthusiasm, they fired too early. This caused some of Leslie’s men to fire back. Major Andrew Leitch was hit three times, once in the hip and twice in the stomach. The shots were fatal for him; he died the next day. Knowlton stepped up on the same ledge to rally his troops. He was shot in the small of the back and caught by Captain Stephen Brown of Woodstock, Connecticut. Brown would recollect later that Knowlton was very calm and said “I do not value my life if we do but get the day.” Knowlton died within an hour. Captain Brown and the Captains of the three Virginia companies, Charles West, John Thornton, and John Ashby, Jr took charge. They lost the element of surprise necessary to outflank, but they pressed hard on Leslie’s men from the east. Nixon’s troops now stopped their feinting tactics and attacked outright. Since Leslie’s troops were outnumbered, they retreated south to get back with the larger group of British troops. But they stopped to mount a defense at the northern edge of a buckwheat field that covered the area from 116th St to 120th St and from Riverside Drive east to Broadway and a little more. The Americans accumulated their forces here. And the British increased their forces with the addition of the Black Watch, reserves from General Cornwallis and the Hessians. At about noon, the Americans that numbered from 1,800 to 2,000 were stretched from Riverside Church to Teachers College: Nixon’s brigade on the western end, Sargent’s, Beall’s and Douglas’ men in the middle, and Knowlton’s and Leitch’s Rangers on the eastern end. The British, consisting of Leslie’s light infantry, the 2nd and 3rd battalions, and the Black Watch, lined up just south and parallel along 119th St. Thus the battle of Harlem Heights was enacted. The Americans fought well, and Generals Putnan, Greene, and Clinton rode back and forth behind the lines to encourage their troops. General George Clinton was an American cousin of the British commander Sir Henry Clinton and the uncle of DeWitt Clinton. Some detail that made it into our history of the battle: Colonel Joseph Reed tried to stop a private, Ebenezer Leffingwell, from running away from the front line. Leffingwell tried to shoot Reed, but his gun misfired. Reed grabbed a musket from someone and tried to shoot Leffingwell, but his gun also misfired. But Reed trounced the private with his sword and had him arrested. A week later and after a court martial, Reed commuted Leffingwell’s sentence of death by firing squad. The British were outnumbered, but would have had about 5,000 troops if Cornwallis’ reserves and the Hessian grenadiers and riflemen caught up with them. Leslie’s advantage was the pair of brass three-pounders, cannons on wheels, that each fired all of their 60 rounds. Thus there was a standoff for two hours – until the Americans started pushing through the line. But Washington ordered his men to break off the engagement and retreat. He didn’t want to get beyond the buckwheat field. His sense was that British reserves were not far off. He was right. And yet the British on the front line decided to retreat. And some Americans, who had not yet heard their order to retreat, chased the British south. There were brief skirmishes at about 111th St and 106th by Jones’ stone house, where the action began earlier in the day. By now the British and Hessian grenadiers accumulated to a force of about 5000. In addition, three British frigates in Stryker’s Bay near West 96th Street opened fire. Cannonballs from the ships were too far away to do any damage and Washington’s order to retreat reached all the men, and so it was reported they gave a resounding “Hurrah” and fell back to the Heights of Harlem. 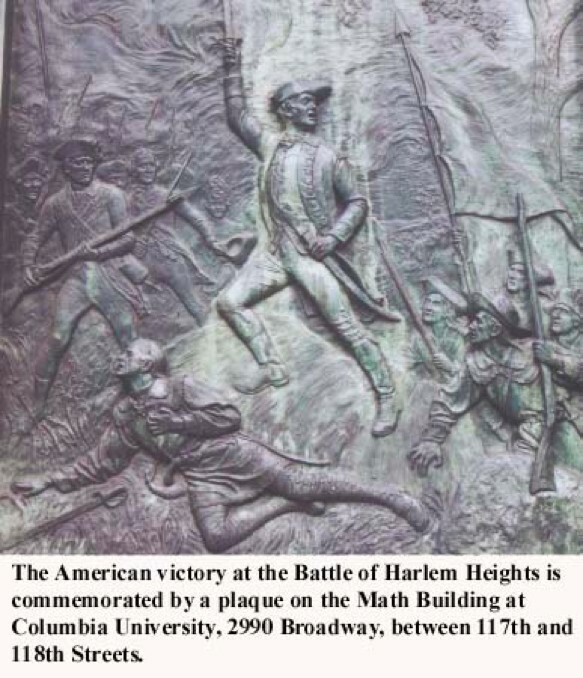 The Battle of Harlem Heights was over on the same day it began, September 16th, 1776. The Americans might have had 100 wounded and 30 deaths. The numbers are not reliable. British had somewhere between 157 to 200 wounded and between 14 and 70 killed. The Americans lost 4 officers, including Leitch and Knowlton. Those Americans who fought in the Battle of Harlem Hghts and were captured were probably placed in the British Prison Ships. The Americans were rightfully proud that they could win in the field against the more professional British troops. The British acknowledged the Americans in this regard by not yet pursuing them, but rather by maintaining a line from Stryker’s Bay to McGowen’s Pass to Horn’s Hook (present day Carl Schurz Park by Gracie Mansion) for the next 26 days.